BCMS violinist Harumi Rhodes and pianist Mihae Lee with cellist Michael Reynolds. Devotés of unjustly neglected music (I count myself among them) were given a belated Christmas present by the Boston Chamber Music Society at MIT’s Kresge Auditorium. 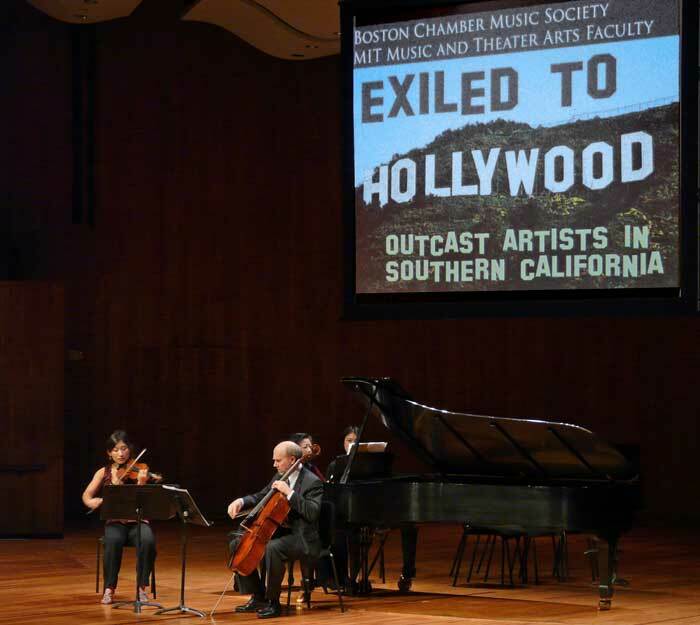 Sponsored by the Goethe-Institut Boston, BCMS and the MIT Music and Theater Arts Faculty presented Exiled to Hollywood: Outcast Artists in Southern California, with works by five such composers. The significant migration of artists and scholars who fled Fascism in Europe in the 1930s has been a hot topic of the last 20 years. With well over 200 opus numbers, Mario Castelnuovo-Tedesco was an exceptionally prolific composer, even excluding the 200-plus movies for which he supplied music. Though his output includes many genres, he is today remembered largely as a composer for guitar and as the teacher of André Previn, Henry Mancini, and John Williams, among others. Violinist Harumi Rhodes, cellist Michael Reynolds, and pianist Mihae Lee gave us a richly colored performance of Castelnuovo-Tedesco’s Piano Trio in G Minor, Op. 70. Written in the early 1930s before the composer emigrated, its style might be termed “post-Romantic,” expressively chromatic but firmly rooted in tonality. The first movement, played with a unanimous, supple rubato, had fine atmosphere, though Lee was perhaps a tad deferential to the strings: the trio didn’t always seem like three equal partners. The second movement, Romanza con variazioni, displayed the composer’s ingenuity of variation technique, sensitively realized here. The final Rondo began with an agitated tarantella character, relaxed in the middle, then built up to an exciting conclusion. The BCMS players made a strong case for a reassessment of the full scope of this composer’s oeuvre. The next group made for a very stark contrast. The talented composer Hanns Eisler was a disciple of Arnold Schoenberg but is not a household name today, possibly owing to his Marxist affiliation and his belief that “music should not stir the emotions but rather be functional, applicable, ‘used for the theatre, cinema, cabaret, television, public events, etc.’” (Program notes by Kathryn J. Allwine Bacasmot.) Alone among these five composers in the concert, Eisler fled the Nazis because he was a Communist, and some years later, after being blacklisted by Hollywood, was deported from the U.S. for the very same reason. His most important collaborator was the writer Bertolt Brecht, who shared his political philosophies. Baritone Chris Pedro Trakas and pianist Randall Hodgkinson gave dramatic accounts of 16 selections from the Hollywood Songbook, whose texts largely concern the plight of political dissidents and refugees. These terse settings rather undermine Eisler’s ideal of functional, non-emotional music. Between the pain and anger permeating nearly all these texts and the intense delivery of Trakas and Hodgkinson, whether vehement or understated, the songs’ power to disturb was indisputable. To cite several highlights: Über den Selbstmord (“About suicide”), discussing times when miserable people are most tempted to end their lives, was mostly pianissimo and eerily seductive, with a jolting subito fortissimo on the final word (“throw their unendurable life away”). In Jeden Morgen . . . the artists fully conveyed Brecht’s mordant humor when describing the life of a screenwriter (or film composer): “Every morning to earn my bread, I go to the market where lies are peddled. Filled with hope, I line up with the other peddlers.” And we were made to feel the anguished irony of Die Heimkehr (The homecoming), a title used often enough in celebratory fashion by various 19th-century lieder composers, but here describing a return to a barely identifiable native city, enveloped in smoke and flame, just after the departure of “swarms of bombers.” One would expect mostly atonal settings of angry or morose texts to be a trial for the listener, but Trakas and Hodgkinson made a riveting theatrical experience of them. As with Maurice Ravel and his Bolero, Ernst Toch found himself best known for a piece he considered an “unimportant diversion,” his Geographical Fugue for spoken chorus. However, he was another highly productive composer in nearly all genres who was awarded the Pulitzer Prize. Though he was a veteran of World War I, as a Jew he was compelled to leave Germany by Hitler’s rise to power. Rhodes and Hodgkinson played Toch’s atonal Sonata for Violin and Piano, Op. 44, from 1928, when he was still enjoying considerable success in the German musical avant garde. The first movement opened savagely — the tempo marking is Trotzig, anstürmend (“Defiant, charging”) — but progressed to imitative writing. Much of the musical interest is derived from the way the two instruments collaborate, sometimes independently, even at cross-purposes, other times in close concert. The sonata is seasoned throughout by flirtations with tonality and, particularly in the latter two movements, the composer’s permutations of rhythm. Rhodes’s and Hodgkinson’s playing was assured and polished, particularly the thrilling fiery conclusion which harkens back to the sonata’s beginning. Louis Gruenberg was the one composer on this program who was not properly an “exile”; he was born in 1884 in Brest-Litovsk (now in Belarus, but then in Russia), but his family emigrated to New York when he was a few months old. He nonetheless crossed the Atlantic repeatedly to study and perform (he was a gifted pianist) in Vienna and Berlin until the arrival of World War I. Gruenberg’s charmingly titled Four Indiscretions, Op. 20, for string quartet, supplied a refreshing touch of levity in the program, as superbly played by violinists Ida Levin and Rhodes, violist Roger Tapping, and cellist Michael Reynolds. Though always interested in the latest compositional techniquest — the composer was a longtime close friend of Schoenberg’s — Gruenberg concentrated mostly on cultivating his “American idiom,” strongly influenced by ragtime, jazz, and spirituals. The first of the four pieces had the feel of a hoedown whose infectious fun was sprinkled with “wrong” notes. The slow movement gives the spotlight successively to each member of the quartet, who all shone both as soloists and ensemble members. The third piece has a jocular first violin part, but there is throughout an enjoyable alternation of the whimsical and the sober. The final piece is pompous and comical, with many laughs quite literally written into the music, and it would be hard to say who was enjoying themselves more, audience or quartet. According to the program notes, the Indiscretions are unrecorded; they would seem to be strong candidates for BCMS’s next recording. The most famous of these exiled artists is the Austrian Erich Wolfgang Korngold, widely hailed as the foremost compositional child prodigy of his age. The Jewish Korngold had the good fortune to have just arrived in Hollywood when the annexation of Austria occurred. We heard first one of hisAbschiedslieder, Op. 14, (Songs of Farewell), Mond, so gehst du wieder auf (“Moon, thus you rise again”). The song on the surface is largely subdued, but there is a pronounced undercurrent of melancholy longing, even burning, skillfully brought out by the performers, Chris Pedro Trakas and Lee. The music only occasionally rose above mezzo piano, but the artists limned many nuances within the limited dynamic range. The concert closed with Korngold’s Piano Quintet in E Major, Op. 15, sumptuously played by Levin, Rhodes, Tapping, Reynolds, and Lee. The work is replete with the composer’s characteristically rich harmonies and colors. Its emotional crux is the middle Adagio, whose theme is borrowed from the song previously heard. Here Korngold is painting on a larger canvas, and the theme is given considerably more development. We heard some beautifully delicate string playing from the quartet, combined with Lee’s velvety pianissimo piano sound, as well as an exquisite violin solo from Levin. A gradual build-up led to an extended climax before tapering off to a whispered ending that held the audience enthralled. 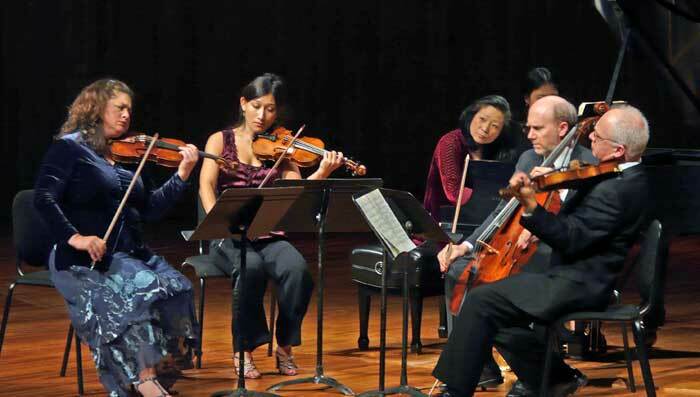 The raging opening of the final movement in strings’ bare octaves soon unexpectedly transitioned to more playful music though the passion never disappeared altogether and reemerged fully in the brilliant coda. Bravo to BCMS and MIT for blowing the dust off some musical treasures that have been neglected for too long. Geoffrey Wieting holds Bachelor’s degrees in organ and Latin from Oberlin College and a Master’s degree in collaborative piano from New England Conservatory. He is a freelance organist, collaborative pianist and vocal coach, and choir member at Trinity Church, Copley Square and in the Back Bay Chorale. Very interesting and informative review. How great to have a whole concert of not-so-often-played music! Your review made me wish I had been attending!